A neutral sleeping position will help you sleep most comfortably. It can also cause a dotted green line appear over your spine (illustrated above). Before I launch into my long-winded critique of extra firm pillows, let’s first consider why we use these strange things in the first place. You use a pillow to fill the gap between your head and your mattress. It helps keep your body in what’s called a “neutral sleeping position.” While in a neutral sleeping position, all the bits and pieces in your neck and back are resting cozy and unstressed. 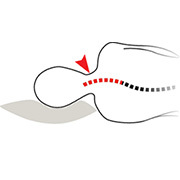 This ideal posture prevents unnecessary pressure on your discs, muscles and nerves. As such, your body is generally best off when positioned in a straight line, parallel to your mattress, without any upward or downward bends in your spine. Stay neutrally aligned and you’ll avoid discomfort and get better rest. For many years I was a committed soft down pillow user. It’s no coincidence that down is a popular pillow filling; it’s malleable, durable, and familiarly comfortable. I didn’t try much else until I was middle aged. Soft traditional pillows tend to flatten out under pressure. Most soft pillows gradually lose their loft (thickness) as you sleep. They compress under the weight of your head and become too thin to sufficiently elevate your head and neck into a neutral position. As a result, your neck falls into an uncomfortable and potentially pain-causing downward bend. Flipping folding and fluffing isn’t a substitute for a consistently comfortable firm pillow that elevates your head properly! provide consistent support. It should be capable of maintaining consistent loft throughout the night, keeping your head positioned appropriately relative to your mattress. Firm pillow filling reduces compressibility ensuring that your head doesn’t sink down into your mattress while you’re asleep. conform to the shape of your head and neck. A firm pillow won’t be comfortable unless it’s able to distribute the weight of your head evenly across its surface, preventing pain-causing pressure points. Some malleable and moldable pillow fillings will adjust to the profile of your body, keeping your head and neck cradled comfortably. If your pillow’s isn’t able to change shape to fit the contour of your body, it’s likely it’ll feel like a rock. What are the firm pillow options? The extra firm pillows on the market today vary considerably. 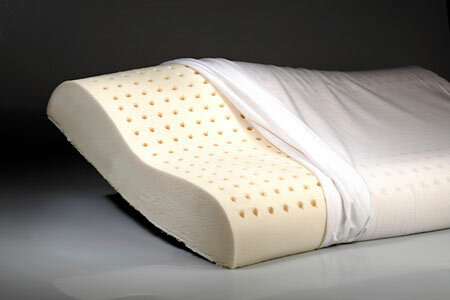 An extra firm down pillow will feel much different than a similarly labeled memory foam pillow. And a buckwheat or microbead pillow can feel unexpectedly firm to those accustomed to the softer pillow types. Finding the right one can be overwhelming. What’s best? The truth is, no single type of pillow works for everyone. Thankfully we have choices – lots and lots of choices. Pillows are most easily categorized by what they’re filled with. A quality fabric pillow case, or shell is an important component, but its general character is dictated by the filling. Your pillow’s filling makes it feel the way it does. Each type of pillow filling has its own advantages and disadvantages and appeals to a unique audience of sleepy heads. Below I’ve summarized the most popular extra firm pillows and their features so that you can get a sense of what might be most appropriate for you and your preferred sleeping position. I’ve arranged them from least (1) to most (5) firm. Overstuffed down or fiberfill pillows are the least firm option in our list, but will appeal to those acclimated to traditional pillow types. At the softer end of extra firm pillow types we have down and fiberfill. These popular pillows are simply packed with extra filling making them less compressible and more consistent in their loft. Fiberfill isn’t very malleable and thus isn’t particularly good at conforming to the shape of your head and neck. On the other hand, down is well-known for its malleable and moldable qualities. Unfortunately when it’s stuffed tightly in an extra firm pillow, a lot of that characteristic is lost. These traditional pillow fillings tend to retain the heat absorbed from your body while you sleep. They can quickly become uncomfortably hot, requiring you to repeatedly flip them to “the cool side” of the pillow. For those accustomed to soft traditional pillows, these are the safe and conservative options that will not surprise you or take any get used to. That said, if you used the search term, “extra firm pillows” to get to this page, I doubt this is the type of pillow you’re looking for. I recommend you try something a little different. 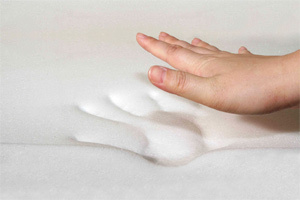 If you’ve ever felt memory foam, you know that it is a very unique feeling material. 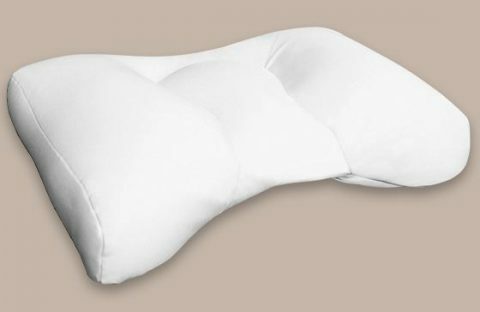 It has an interesting texture that conforms to pressure unlike any other pillow filling. Unfortunately it tends to lose loft when warmed. After absorbing body heat, they become thinner, resulting in a pillow that doesn’t elevate your head properly. The absorbed body heat tends to make memory foam uncomfortably warm too! One of the biggest complaints by owners of memory foam pillows and mattresses is the unpleasant, and potentially unhealthy chemical smell. Memory foam is manufactured using polyurethane and several other chemicals, so it isn’t surprising that it emits a chemical odor. This “off gassing” of volatile organic compounds is a common and well-documented property of memory foam pillows and mattresses. The fumes are often compared to those experienced in a freshly painted room. Unfortunately some of the chemicals used in memory foam aren’t entirely benign. Latex pillows are firm and supportive, but lacking in malleability. Latex pillows are firm, supportive and durable. Their filling is extracted from a Hevea-Brasilienis tree, also known as a rubber tree. 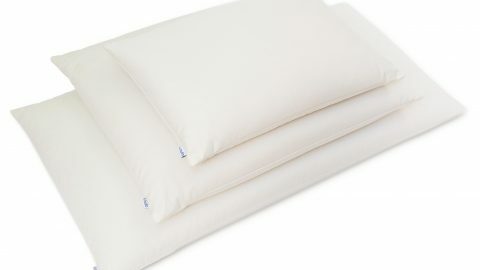 Being that they aren’t made from a cocktail of strange petrochemicals, latex pillows are often marketed as being a natural and safe alternative to other pillow types like memory foam. Unfortunately latex pillows aren’t moldable. You can’t change its shape to fit your head and neck. No matter how you push, smoosh and squeeze, it’ll bounce back into it’s original rectangular shape. This is a deal-breaker for some, myself included. What’s more, latex, like memory foam and down, tends to absorb and retain body heat. They’re often perforated with small holes in an attempt to increase airflow (see photo at right). Provided you’ve taken the time to fill it properly, a water pillow will consistently keep your head elevated at just the right level all night long. Water isn’t compressible, but when contained in a plastic bag will adapt its shape to your head perfectly, providing consistent support all night. Not many pillow types are adjustable. Water pillows are. Just add the appropriate amount of magical H20 and you have the perfect loft for your pillow. This is a big advantage. It can be very difficult to find the pillow that’s just right for you-they’re always either too thick or thin! Water pillows aren’t moldable. 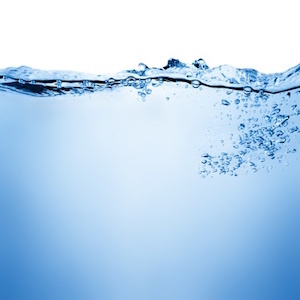 That pesky water always bounces back, making it a frustrating solution for many. Some types may be wrapped in a fiberfill that’s too soft. I’ve tried a water pillow before. It was wrapped in a super soft fiberfill that pushed upward awkwardly into the side of my face. 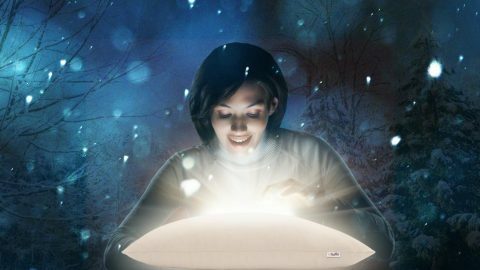 Read More: Sailing the Sea of Sleep on a Water Pillow: Does It Work? Filled with happy microbeads that will ruin the earth for future generations! Filled with thousands of tiny pieces of polystyrene, microbead pillows are a rather unique extra firm pillow option. While it feels quite soft when initially handled, when pressure is applied, these pillows give firm and resilient support that will not compress or collapse. Additionally, a microbead pillow is moldable and malleable. It’ll conform to the unique space between your head and mattress. The support provided is even and comfortable, effectively eliminating all pressure points. They’re also breathable. No flipping to the cool side of the pillow! 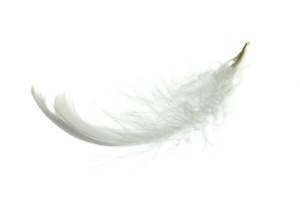 like memory foam, they’re manufactured with chemicals that emit a powerful odor (off-gassing). When, new out of the box, the stench is hard to ignore. The polystyrene they’re filled with is horrible for the environment as well. The filling loses its elasticity and volume over time. With moderate use, the polystyrene filling flattens out, resulting in inadequate loft. Finally, the individual microbeads don’t grip each other because of their smooth rounded edges. This causes the pillow to loose its shape, requiring frequent readjustment. I love these things! I stumbled upon buckwheat pillows years ago after a friend recommended them. They were so impressive that I decided to manufacture and sell them myself! Years later, after trying practically every pillow type available, I’ve yet to find a better alternative. Experiment with the options before you commit to an extra firm pillow type. There really is no substitute for literally “sleeping on it.” Squeezing a pillow inside plastic packaging at the store isn’t the way to find your ideal pillow. You really need to test drive them in your own bed if possible. Check the manufacturer’s return policy and make sure that you’re able to try it for at least a week. If it’s not right for you, toss it back in the box and ship it back. You spend a third of your life with your head resting on a pillow, so a little shopping and experimentation (and some return shipping expense) is absolutely worth it. Above all, your pillow needs to be comfortable. Trust your instincts and don’t get too caught up in marketing literature. Price is, of course, a valid concern for the discerning shopper. It’s easy to mistakenly substitute a quality product for the cheaper, substandard alternative. Prices are convincing drivers of behavior! Unfortunately, the cheapest option usually isn’t the most cost-effective or the most comfortable. If you’re price-minded, remember that the initial cost of your pillow can be deceiving. It’s easy for consumers to overlook the amount of money they pour into pillows. They simply grab the cheap pillows that are available at the local department store and replace them when needed (often). The fact is that the frequency of replacement is what really determines how much you’re spending on pillows for you and your family. Spending a little more now on a well-made product can save you in the long run if it lasts several years. Spending a little more now on a pillow that’s great vs. just OK is worth it. You spend a third of your life on your pillow, after all. Better sleep is priceless. My Recommendation: try a buckwheat pillow. I’ve been sleeping on buckwheat pillows for years and love them. 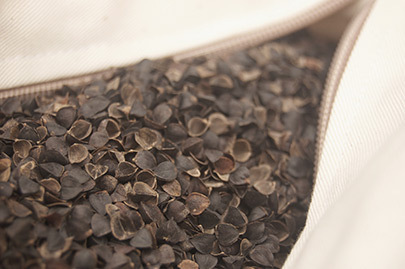 Have you tried a buckwheat pillow? Give Hullo a try for 60 nights. If you're not sleeping better, send it back to us for a full refund.